I often wonder what impression people get from the national media reports, if they’re not able to see for themselves the extent of the flooding. The media like to get a reporter in waders standing in water. I saw one today being interviewed in Skeldergate, near the Bonding Warehouse, waders on, flooded street behind, giving the impression that the whole city is inundated. In fact it’s very localised, the streets and buildings alongside the river. But in those streets, it has a dramatic effect. 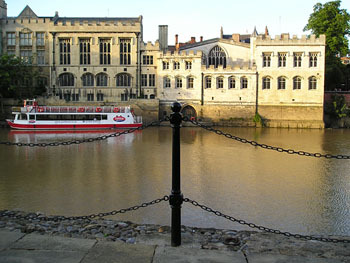 To give the normal context, here’s an image taken from Wellington Row (turns into North Street a little further along), just below Lendal Bridge, looking across to the Guildhall and York Boat premises on the opposite bank. This is how it looks in a non-flood situation. 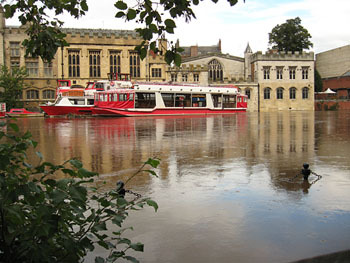 The same buildings and boats, this afternoon (from a slightly different angle). The riverside walkway I took the earlier photo from is now underwater, and you can just see the very top of the metal fencing post so prominent in that photo – the rest is submerged. 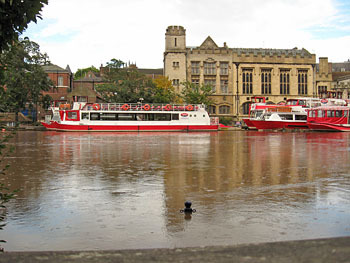 The boats, floating on the risen Ouse, have risen to obscure most of the windows of the Guildhall buildings. 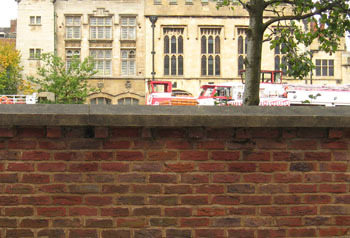 The floodgates and walls are holding the swollen river, and this photo was taken from the pavement on the other side of the wall. The oddest thing of all was to walk along Wellington Row into North Street with boats at head height. Normally they’re not visible. 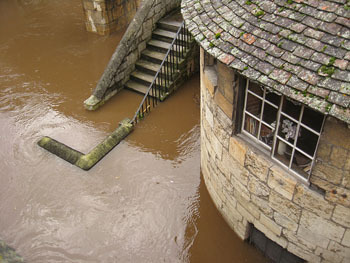 Something bizarre in having boats rising above where you’re walking, with a river held in place by floodgates and walls.